I’ve been a fan of Ari Goldwag’s for quite a while, and with that a fan of Sheves Chaverim and Sheves Achim. So it goes without saying that I was excited to see that a new Sheves Chaverim CD was forthcoming. For a little bit of background: the first of the “Sheves” CDs was Sheves Achim, featuring brothers (hence the name) Shimon and Moshe Bell. This was way back in 2009. The Bell brothers had incredible voices and range, and combined with Ari Goldwag’s brilliant compositions we all know and love, the album was a combination of fun pumping techno songs (Ogil, Modim) and beautiful stirring compositions (Mi Ha’ish, Avraham Yagel) . But one after the other, they were all solid songs, and its an album I still listen to quite frequently. Not long after, Sheves Chaverim came out. It had a similar feel to Sheves Achim, except of course its a group of “friends”. Moshe Bell is featured once again along with Shlomo Lipman, Yair Frohlich, Baruch Sheff, and Moshe Dov Goldwag, who we got our first look at. Sheves Chaverim had one of my favorite songs of all time, which wasn’t a big hit (well its a big hit in my house)– Sof Davar, and was another quality album. Just two years later Sheves Achim 2 was released. It featured grown-up (teenaged) versions of Shimon and Moshe Bell. While it was similar to the first two CDs in many ways, the voices are adult. It was a great followup. 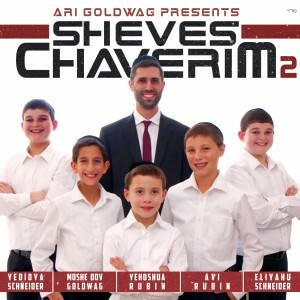 It’s been 4 years since a “Sheves” release, and I’m happy to see that although all but one of the kids have essentially aged out of Sheves Chaverim, the group is here to stay. It’s important to keep in mind that Sheves Chaverim is a group, not a choir, which is a big distinction. Obviously its smaller, but this also means we get harmonies and the choir background while still letting each of these voices shine on their own. Having Ari Goldwag behind the CD means that we can expect some beautiful songs along with some that make you jump up and down, and that there will be a positive and happy message throughout. There is a bit of a techno , modern feel behind the whole album, and while the music is fine (its not a full orchestra, etc. ), the stars of the albums are the vocals and the compositions. Do not expect a minute long violin solo. These boys’ voices are better than violins anyway! This song was already released as a single along with a fun music video that I have watched so many times I see it in my head while I listen. If you haven’t heard it, check out the video. Its definitely single-worthy: catchy, upbeat, and a great positive message. I love this song, but I wish their voices were not techno-fied in some of the solos. I know its something most people enjoy, but when you have great voices, its not necessary in my opinion. I hope to see more from newcomer Rafi Gantshar in the future if this is any indication of his talents. This song was almost on Am Echad, and while I’m sure that version was great, I like how it works with so many voices, so good choice holding off on it! Its got sort of a give-and-take feel (think “Min Haolam” from Am Echad meets “Modim” from Sheves Achim 1). A pumping, high energy, fun song, and you will appreciate how Ari Goldwag is able to show off their talents in a song that could have easily turned into screaming, but is instead controlled and pleasant to listen to. The first slow song on the album, this was written by Ari Goldwag back in 2000 during the second intifada. It’s sung here with a Israeli accents and has the traditional “Kol haolam kulo…” lyrics mixed with an English bridge. Sadly , the lyrics are timely once again with what Am Yisrael is going through, and the message here is a positive one. “‘Cuz one day it will be clear, How Hashem’s hand held us all through the night”. Very pretty song; I can imagine this one sung around a campfire in Israel. No, not a typo, this song was composed by Moshe Dov, and it happens to be one of my favorites on the album. Its higher tempo, but laid back and the music is light. Now that Moshe Dov’s compositions (and co-compositions) are showing up more and more, we are beginning to really sense his style, and I’m loving it. Important question though: when is a father son album coming out? Ari Goldwag composed this song in honor of the birth of his daughter Tehilla. I’ll always look for another Sof Davar, because I just can’t get enough, but in a few ways this song is similar. It probably features the choir as a whole more than any other song. The lyrics feel simple, but are at the same time very powerful. On the surface the whole song seems somewhat simple– in a good way, because some things are better left as they are– but once you listen a few times you hear how much thought went into every aspect to give it that feel. Love this song, it’s beautiful. My favorite! And it’s incredible how this song was composed– Ari Goldwag’s sister, Shoshana, composed the low part on the spot at the Shabbos table. Wow. I listen to this one over and over. It has a light-hearted, fun feel, with music reminiscent of the late 1950s/early 60s. Definitely a clap along song where all three parts (the low part, the high part and the “oooOOooo” throughout) work perfectly together. I especially love the ending of the high part and how each of the soloists sort of makes it their own. We first heard this song on A Capella Soul 2, but of course, it was music-less and featured the voices of “only” Moshe Dov & Ari Goldwag. A great version of a great song. Ari Goldwag used these beautiful familiar lyrics, some of the best that exist in my opinion, to honor his sister Melissa (whose Hebrew name is Rachel). This starts out with a the choir doing “na na na” followed by the Schneider brothers with some incredible harmonies. The solo at 1:20-1:40 is one of the best on the album (one of the Schneiders, but I’m not sure who). . Here we have another song with simple instrumentation, lots of choir, gorgeous emotional lyrics, and powerful solos. Sort of like Tehilos, but I like this one better. I especially love Ari Goldwag’s part here. Then another solo right after by Avi Rubin…amazing. How do they hold the notes so long? Easily my favorite slow song. Just gorgeous. This song has an old school feel with lots of horns and more traditional percussion and reminds me a bit of Tisgadal from Sheves Chaverim 1. Another one of my favorite fast songs (how many favorites am I allowed?). This song has a special treat… we get to hear from two former members. Yair Frohlich was the main soloist of Sheves Chaverim 1.0, but his voice sounds quite different now– still smooth and pleasant but of course all grown up. I saw an old review that said Yair Frohlich as a kid sounded like Ari Goldwag as a kid…and I’m not surprised, because his mature voice DOES have similarities to Ari Goldwag’s. We heard Elisha Willig on “Min Haolam”, and his voice basically sounds the same as it did then (very good of course). You’ve gotta love such a meaningful song that is sung by father and son together. Its great to compare this to the “Aleinu” they put out years back… I loved it. But they’ve gotten so much better as a pair. Enjoyable, light slow-ish song that is timely for us all. A Hebrew version of “Forever Dance” from Ari Goldwag’s English Album. We already knew this was a great song, and this version is no different. It REALLY makes you want to dance! All in all, its another success for Ari Goldwag and Company! Borchu reminds me of Ogil and Ki Eilecha, while Eliyahu seems to be a mix of Shallow Waters, Nodeh and Hashem Loves You. It seems that Ari Goldwag has a more prominent singing role on this album than the previous Sheves albums. My favourites on this album: Lo Lefached, Mei’ein, Hoshia Na and Shir Ushvacha. Thanks for the feedback! I agree with a lot of the things you said and I definitely should have mentioned that Ari Goldwag’s singing is featured a lot more on this album. Glad you are enjoying the album as much as I am !